Many people don’t give sediment in plumbing a second thought until they notice external signs that it may be present, such as discolouration of the water, or an unexplained drop in water pressure. While sediment build-up over time may be a fact of life, rather than shrugging your shoulders and ignoring the issue, there are some compelling reasons to pay close attention and take remedial action. From a Legionella control point of view, sediment is a particular problem as it provides a vital food source for bacteria. Whether the sediment is caused by silt, limescale or rust, as a form of organic matter it provides nutrients for bacteria, enabling them to flourish in the water system. Rust is one of the primary sources of sediment in plumbing. 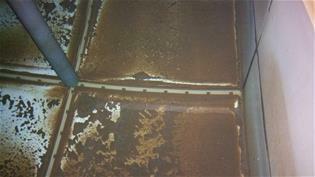 This is often as a result of old iron pipework, but it could also derive from your water tank. Rusting is an indication of deterioration in the fabric of the plumbing, not only creating sediment but also increasingly the likelihood of leaks. If you or your tenants notice the water turning a brown or orange colour, it is probably a sign of rust in the system and you will need to call in a plumber to find the problem areas and replace the pipework. It’s worth noting that the elderly and rusting pipework at a veterans’ home in Illinois is thought to be one of the main causes of the building’s persistent outbreaks of Legionnaires’ disease – a problem that will cost many millions of dollars to fix. So, rather than waiting for rust to be an expensive problem, we advocate an annual inspection of your pipework and tanks to look for early signs of any such corrosion. Limescale build-up is another common source of sediment in plumbing systems and, since the majority of the UK water supply is classified as hard water, limescale is a significant issue. While it is obvious when limescale deposits have built up around a tap outlet or the outside of a showerhead, you can be sure that where there are external indications there is probably a much more serious hidden problem inside your pipes. Again, limescale provides food for bacteria, as well as potentially damaging the inner workings of appliances such as dishwashers and washing machines. As with rust, prevention is better than cure, so instigate a programme of regular descaling as an effective way of keeping matters under control and reducing sediment build-up. In extreme cases, you could consider installing a water softener or filtration system. A less common source of sediment in plumbing is when small particles (debris) get into your water system. The most likely culprit is your water tank if it has an ill-fitting lid, or even no lid at all. Wherever your tank is situated, it’s vital that it has a proper lid which keeps dirt and debris out of the water, as the introduction of animal droppings (or even dead animals), and other organic matter, is potentially very dangerous for your water supply. Not only could the sediment cause considerable problems with water flow, but the level of bacteria (and food for bacteria) would be extremely hazardous to health. An annual inspection of your water tank is a must, as is the requirement to take action if you find the lid is broken or otherwise not providing adequate protection from external contamination. If you find that sediment in plumbing is a persistent problem, or the remedial measures described above don’t sort the problem out, your best course of action is to ask a plumber to flush your entire system. By using the force of the water, it’s possible to dislodge and remove sediment from the pipework, as well as from water heaters (calorifers). Another benefit of flushing is that it helps to prevent water stagnation (another risk factor for Legionella growth). As we have written about previously, flushing little-used outlets, as well as running taps weekly if a property is unoccupied, are important for reducing the likelihood of bacterial growth. If you need help or advice on sediment or any other aspect of Legionella control, contact us without delay.